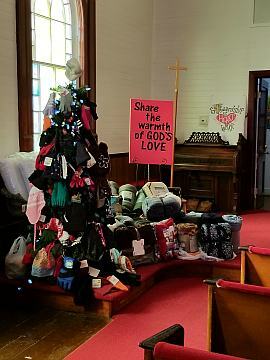 Each month, St. John's, through the help of the outreach committee and congregation, participates in an outreach project. The purpose of these projects is to help those in need within the community as well as those that are not located in this community. As Jesus said, "It is more Blessed to give than to receive." Our Outreach project for April is collecting new and slightly used books for kindergarten through fifth grade for the Indian Hollow Elementary School's summer reading program. The youth will collect books during the Offering or you can drop them in the apple basket behind the piano. Please contact Nancy Pitcock with any questions. For Additional information, select this link. We are collecting individually wrapped candy, small toys and money for CCAP Easter baskets. Our goal is 40 Easter baskets. The last day to submit these items will be Sunday, April 7, 2019. 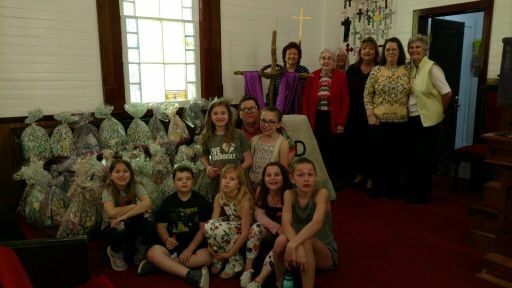 The baskets will be assembled on Sunday, April 14, 2019 at 10 a.m. in the social hall. 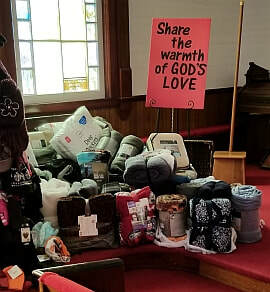 The baskets will be delivered to CCAP on Monday, April 15, 2019. Please see or email Linda Riddle or Linda Allamong with any questions or to donate cash. Our Outreach project for the month of February will be to collect funds to benefit ELCA World Hunger. 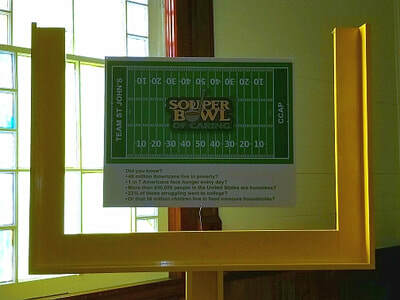 St. John’s Youth will be performing a “Noisy Collection” during the offering throughout the month of February to benefit the ELCA World Hunger campaign. Dig into your couch cushions and under your car seats to contribute to our collection each Sunday in February! Thanks for supporting our youth and the ELCA World Hunger Campaign! If you prefer to make a donation by check, it may be made payable to either “ELCA World Hunger” or to St. John's with "ELCA World Hunger" in the memo line. You may place your check in the offering plate. If you have any questions, please contact Nancy Pitcock or Jenae Jenkins. Please click here ELCA World Hunger to find out more about how collections for this cause have benefitted others throughout the world. These things may seem trivial to most of us, but to those that have nothing, it means the world. Thank you for your support! Update: The response from the congregation for this outreach project was great, $617.08 was collected and will benefit ELCA World Hunger. Thank you so much for your generosity. Our outreach project for the month of January will be to collect food/cans of soup for CCAP for Souper Bowl Sunday on February 3, 2019. 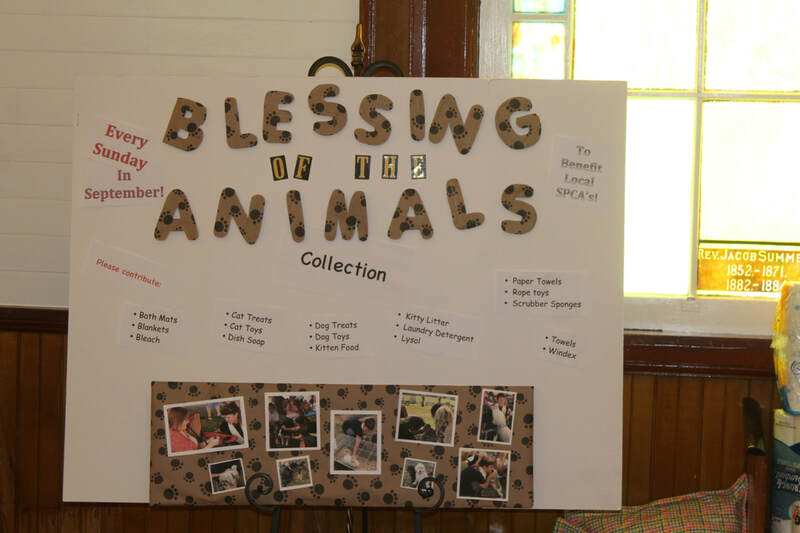 Please bring your donations and the children will collect them during the offering and "hand them off" and into the tote. If you have any questions, please contact Tina Clutter. Thank you for your support! 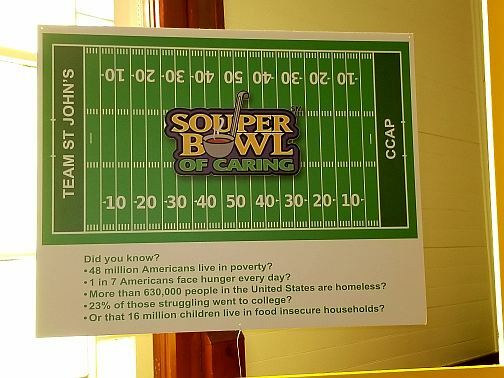 ​Update: Through our "Souper Bowl Sunday" Outreach Project during the month of January, 2019, we collected 540 cans/boxes of soup for CCAP . Touchdown! Everyone is a winner! Thank you very much to all who so generously contributed! The items will be delivered soon. Our outreach project for the month of December will be to help a family in need from Indian Hollow Elementary School celebrate Christmas. Kim will shop for us and is now collecting monetary donations. If you would rather donate items see or email (by clicking on her name) Kim Eckley for a list for the children (a boy and two girls). You may also click on December list if you would like to download a copy of the list. Please note: Shoes have been purchased. No more needed. Sunday, December 16, 2018 will be the final day to donate money and/or items. 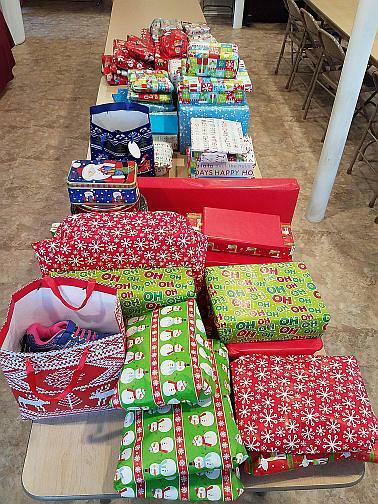 If you would like to help wrap the donated items, please be at the church by no later than 10:00 a.m. Presents will be wrapped in the social hall. 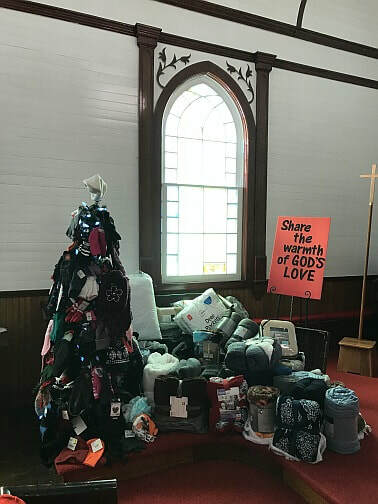 Update: Once again, thanks to the generosity of our church family, we are able to help the family in need from Indian Hollow Elementary School celebrate their Christmas. 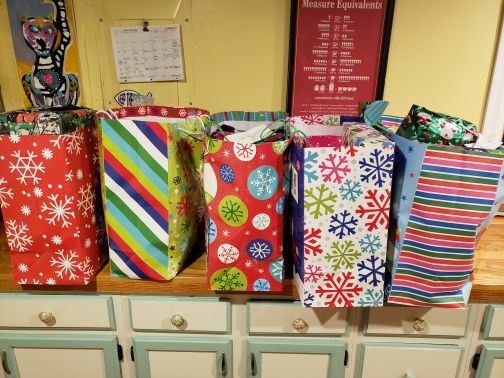 Thanks to Mary Rosenberger, Gloria keiter, Stephanie and Eric Petitta and Kim Eckley for wrapping these presents. Kim will be delivering them Tuesday, December 18, 2018. Thank you so much for thinking of others especially during this time of year! ​ Please click on the photos for a better view. 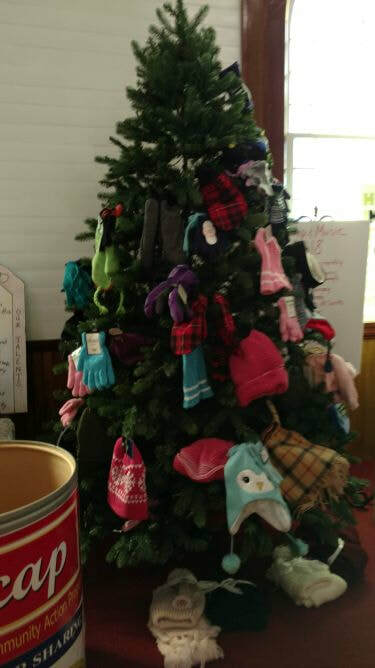 The photos below are from Sunday, November 11, 2018 - The Hat and Mitten Tree is starting to fill up. The collection of blankets is growing as well. The photos above are from Sunday, November 4, 2018 (the first Sunday of our outreach project). Please click on the photos for a better view. 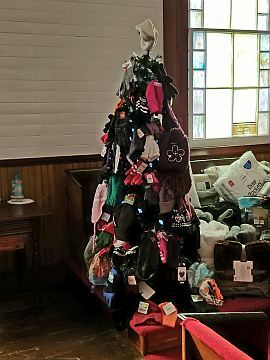 The photos below are from Sunday, November 17, 2018 - The Hat and Mitten Tree is starting to fill up. 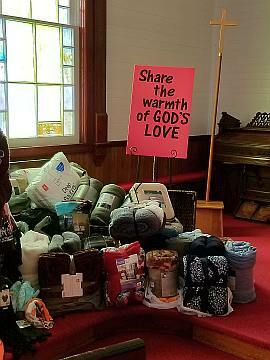 The collection of blankets and other items continues to grow as well. Please click on the photos for a better view. 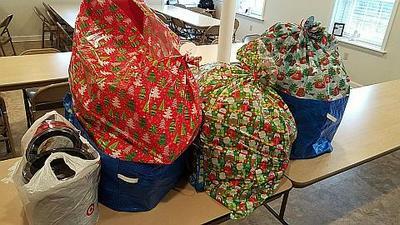 ​Sue Goodwin delivered the items to CCAP. Our Outreach Project for October will benefit Bright Futures Frederick-Winchester. Bright Futures - Frederick/Winchester supports students in our community and runs a food pack program for those that are facing food insecurity. Each week, 900 students at all grade levels are provided a food pack. Over the course of a month, 3,600 food packs are provided to students. It is estimated that an additional 1,600 students could benefit from this program in Frederick County and Winchester. We are collecting single-serve food items to be used in the food packs - (select the Food List button below for a list of items needed) . Or, you can help by providing a cash or check donation to Bright Futures. Thank you for supporting Bright Futures and these students! Please see or email Sarah Murphy with any questions you may have. ​Update: ​We collected 804 single serve items for the October Outreach Project for Frederick/Winchester Bright Futures. Sarah Murphy delivered the items. Thank you very much to those who contributed! 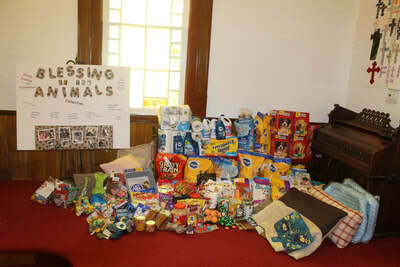 ​Our Outreach for the month of September is collecting needed items for the Winchester, Frederick and Clarke SPCA. We’ll be collecting kitty litter, cat treats, cat toys, kitten food, dog treats, dog toys, rope toys, paper towels, laundry detergent, Lysol, bleach, Windex, dish soap, scrubber sponges, towels, blankets and bath mats (these three latter items may be gently used). Please bring your item(s) for the SPCA and place in the dog food can! Please see or email Doug Williams, Tina Clutter or Pastor Sonya with any questions you may have. 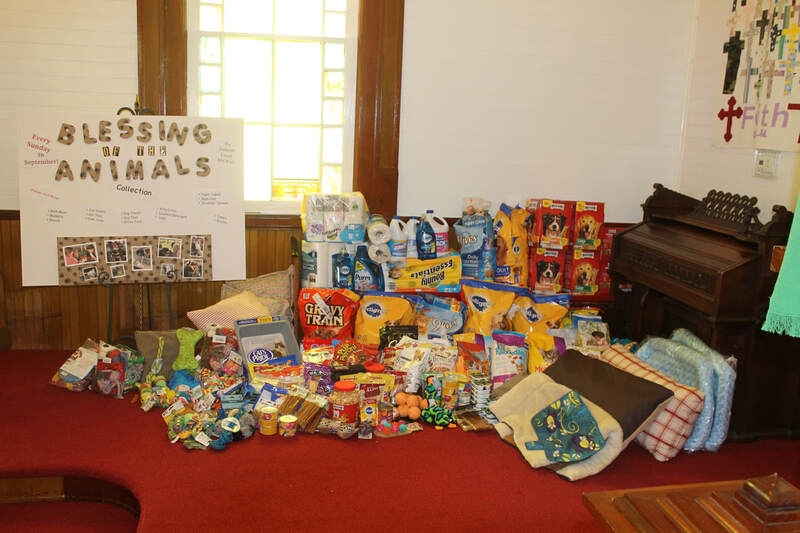 Update: We collected 187 items and $100 for the Shenandoah and Frederick County Animal Shelters, as well as the Winchester, Frederick and Clarke SPCA. Thank you for making this possible. We are collecting diapers and wipes for the Red Wagon Ministry for our community outreach project in June. The mission of the Red Wagon Ministry is to share the love of Christ with others by providing disposable diapers and wipes to low-income families. For those of you that would like to print the list for shopping purposes, please click here. Please contact Amy Maphiswith any questions. The Red Wagon Ministry can also use volunteers. Anyone who is willing and able to help, please contact theredministry@gmail.com. ​Help us Provide Lunches and other items to the ​Lutheran Family Services of Virginia (LFS) sponsored Winchester/Frederick County Therapeutic Day Treatment Program—Summer 2018—by donating cash, check, Walmart gift cards or other items for Lutheran Family Services summer lunch program. Checks should be made payable to “St. John’s Lutheran Church” (just write “lunch program” in the memo). 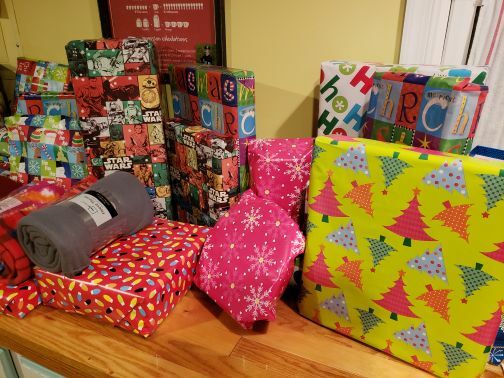 You may also provide the following: basketballs, footballs, tennis balls, school glue (white), disposable gloves, pasta (different shapes & sizes), construction paper, painters tape x2, masking tape, poster boards, yarn, paper plates, paper cups, small envelopes, popsicle sticks, empty match boxes, newspapers, old magazines, etc. You may also click here to see the wish/need list. Please contact Sue Goodwin with any questions. The Acolyte will collect Walmart gift cards, cash and checks during the offering using the white wooden box. 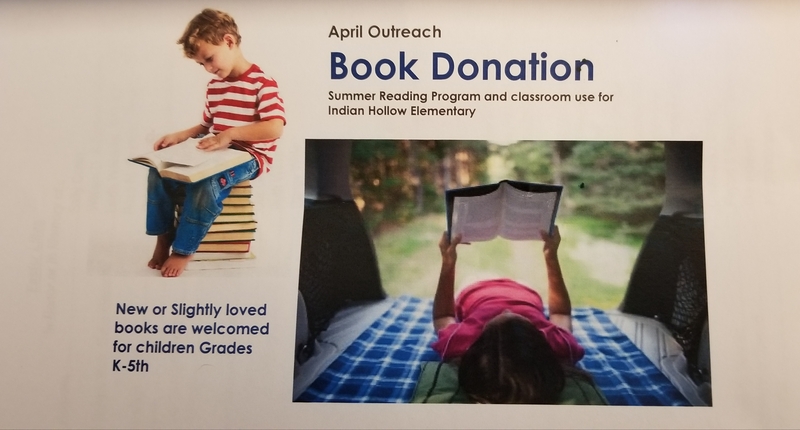 Our Outreach project for April is collecting new and slightly used books for kindergarten through fifth grade for the Indian Hollow Elementary School's summer reading program. The youth will collect books during the Offering or you can drop them in the bookworm (crates) located beside the CCAP can. Please contact Nancy Pitcock with any questions. For Additional information,select this link. Update: We collected 415 books for Indian Hollow Elementary School’s summer reading program. Great job everyone, thank you for your generosity. Indian Hollow was thankful for the support St. Johns provides them. We are collecting individually wrapped candy, small toys and money for 40 CCAP Easter baskets. The last day to submit these items will be Sunday, March 11, 2018. The baskets will be assembled on Sunday, March 18, 2018 at 10 a.m. in the social hall. The baskets will be delivered to CCAP on Monday, March 19, 2018. Please see Linda Allamong or Linda Riddle with any questions or to donate cash. ​Our Outreach project for the month of February will be to collect funds to benefit World Hunger. Checks may be made payable to either ELCA World Hunger or to St. John's with "ELCA World Hunger" in the memo line. You may place your check in the offering plate. Our youth will collect loose change for this effort during the offering. If you have any questions, please contact Nancy Pitcock. Update: The response from the congregation for this outreach project was great, $569 was collected and will benefit ELCA World Hunger. Thank you so much for your generosity. 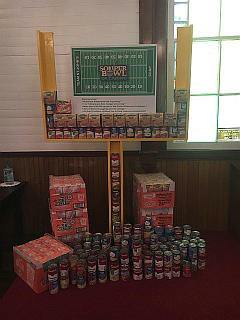 ​Our outreach project for the month of January will be to collect food/cans of soup for CCAP for Souper Bowl Sunday on February 4, 2018. Please bring your donations and the children will collect them during the offering and "fumble" them into the tote. If you have any questions, please contact Tina Clutter. Thank you for your support! Our outreach project for the month of December will be to help a family in need from Indian Hollow Elementary School celebrate Christmas. Kim will shop for us and is now collecting monetary donations. If you would rather donate items see or email (by clicking on their name) Kim or Doug for a list for the children (a girl and two boys). You may also click on December list if you would like to download a copy of the list. 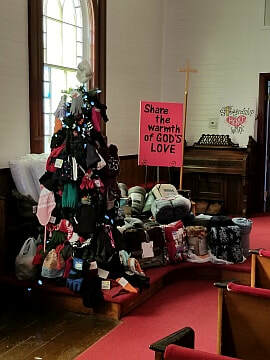 Sunday, December 10, 2017 will be the last Sunday to donate gifts/funds for the December Outreach project. 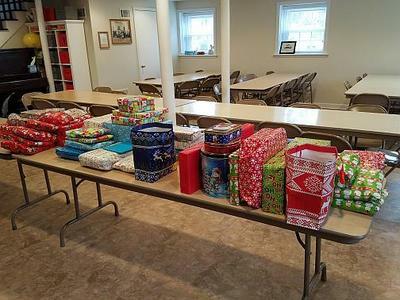 Presents will be wrapped on Sunday, December 17, 2017 in the social hall at 10 a.m.
Update: The response from the congregation for this outreach project was amazing (as you can see by the pictures below). 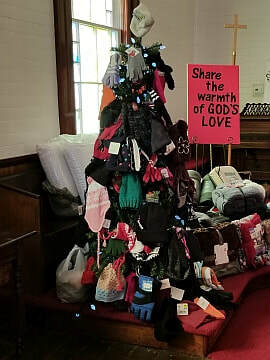 We collected the following: 16 throws, 5 pillows, 23 blankets, 34 scarves, 1 sleeping bag, 68 hats, 13 scarf & hat sets, 24 sets of men’s gloves, 47 sets of ladies’ gloves and 44 sets of children’s gloves. 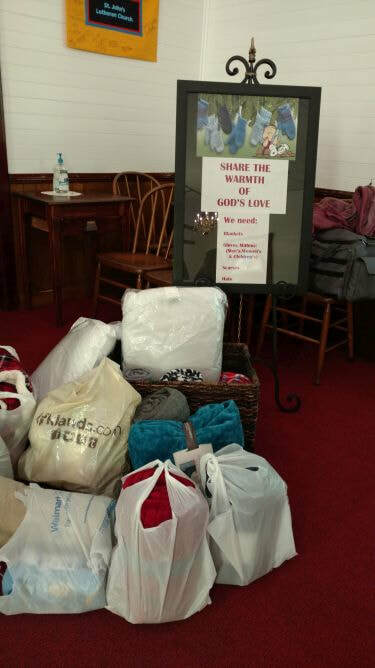 Thank you so much for your generosity and Sharing the Warmth of God’s Love (this truly came from the heart). 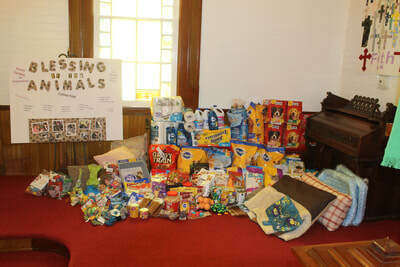 These items will be delivered to CCAP this week where they will be distributed to those in need. Our Outreach for the month of October is collecting needed items for the Winchester, Frederick and Clarke SPCA. We’ll be collecting kitty litter, kitten food, cat food, cat toys, dog toys, rope toys, dog treats, paper towels, bleach, Lysol, Windex, laundry detergent, towels, blankets, bath mats (these three latter items may be gently used), dish soap, and scrubber sponges. Please bring your item(s) for the SPCA and place in the dog food can! Please email Sue Eyre any questions you may have. Update: Approximately $500 worth of toys, food, treats, pillows, towels, paper towels, kitty litter, dish and laundry detergent and bleach was donated (See Picture below). Some of which was donated by Gravel Springs. 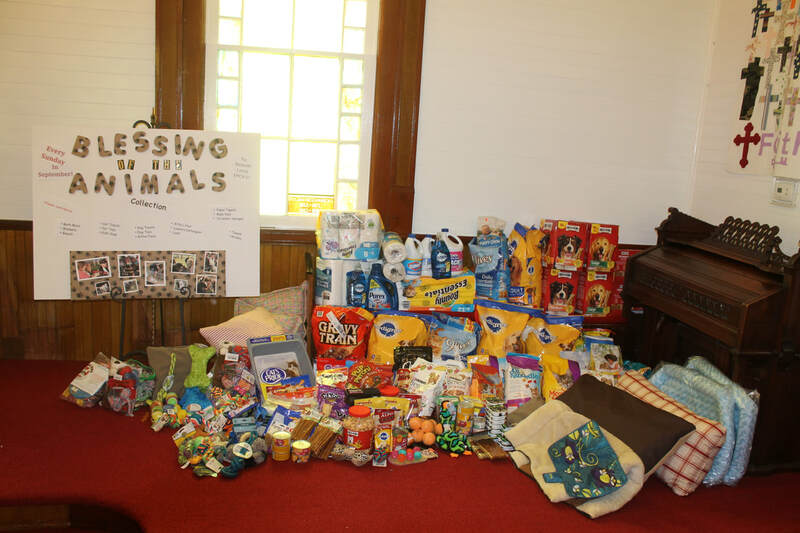 The items were divided into thirds and have been donated to the Shenandoah and Frederick County Animal Shelters, as well as the Winchester, Frederick and Clarke SPCA. Sue Eyre dropped off items to the Frederick County Animal Shelter and the SPCA on November 6, 2017. The agencies were very grateful!! Once again, great job. Thanks to the congregations at St. John’s and Gravel Springs who made this possible. Our Outreach Project for September will benefit Bright Futures Frederick-Winchester. We are collecting single serve food items (select the Food List button below for a list of items needed) or cash. This organization provides weekend backpacks of food for over 700 students from nine (9) Frederick County and four (4) Winchester City schools who are experiencing food insecurity at home. They would like the program to grow and foresee between 2,000 to 2,500 students who are in need. ​Please see Sarah Murphy with any questions you may have. Update: We were able to collect and donate $40 and 59 items to benefit our September Outreach Project for Frederick/Winchester Bright Futures. Sarah Murphy has delivered the money and items. Great job, thanks to all who made this possible! Our Outreach for the month of August is collecting school supplies for Indian Hollow Elementary School. Please see the bulletins for more details. For a list of school supplies required for kindergarten through fifth grade, click on the link listed below. 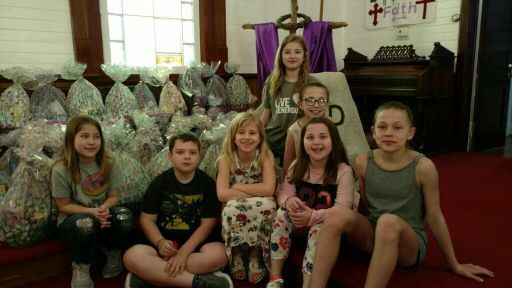 Update: Once again, thanks to the generosity of our church family, the following supplies were collected for and dontated to Indian Hollow Elementary School: 6 packs of erasers, 11 packs of pencils, 14 glue sticks, 6 bottles of Elmer's glue, 22 boxes of crayons, 6 boxes of colored pencils, 8 boxes of magic markers, 1 pack of dry erase markers, 2 packs of highlighters, 36 spiral notebooks, 5 scissors, 8 pencil boxes, 3 binder pouches, 5 boxes of Ziploc bags, 4 boxes of Kleenexes, 9 back packs, 11 packs of notebook paper, 10 binders, 25 composition books, 21 pocket folders, 2 packages of tape and 1 pencil sharpener. Our Outreach for the month of July is in support of The Laurel Center; Intervention for Domestic and Sexual Violence (formerly the Shelter for Abused Women). The Laurel Center provides support for women and children by serving as family advocates, offering hope and courage, strength and resilience, to families of domestic violence, sexual assault, and stalking. They let the women and children know they are not alone and that help is available. 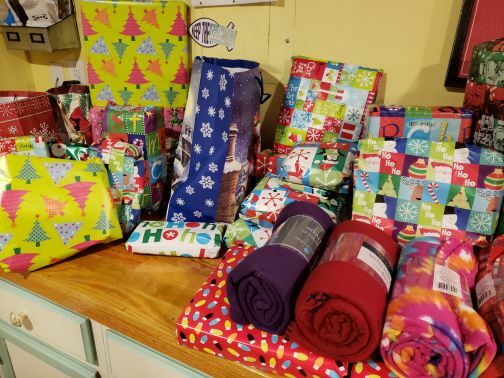 Please join us in helping the Laurel Center provide care and support to these families by donating household products, clothing, food, drinks, bus tickets, or gift cards. Your kind support is much appreciated. Please see Melissa Seward with any questions. 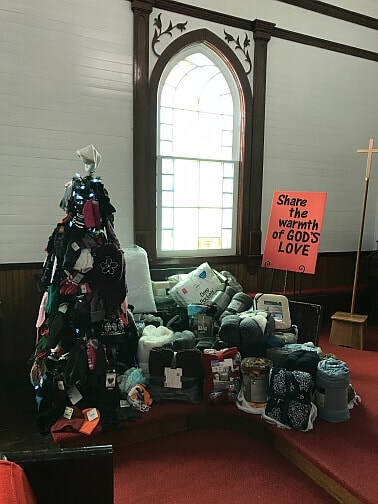 Update: Thanks to the generosity of our church family, much needed donations of sheet sets, clothing, soaps, shampoos, tooth brushes, paper products, towels, washcloths, hand towels, snacks, cases of water, and many school supplies for children which included backpacks, lunch boxes, notebooks, paper, pencils, journals, and spiral notebooks! Melissa Seward will deliver all of these items to the Laurel Center Monday, July 31st! Update: Thanks to the generosity of our church family, we collected a total of 1,042 diapers and 2,236 wipes for the Red Wagon Ministries. ​Thank you for your support. Help us Provide Lunches to the ​Winchester/Frederick County Therapeutic Day Treatment Program—Summer 2017—by donating cash, check or Walmart gift cards for Lutheran Family Services summer lunch program. Checks should be made payable to “St. John’s Lutheran Church” (just write “lunch program” in the memo). The co-directors expect to provide 1200 lunches to students from June 19th-July 21st. Please contact Sue Goodwin with any questions. Thanks to the generosity of our church family, we collected a total of $319.03 (cash, checks and gift cards) to provide Lunches to the ​Winchester/Frederick County Therapeutic Day Treatment Program—Summer 2017. Thank you for your support. ​We collected 385 books and $56 for the Indian Hollow Elementary School’s summer reading program (known as Trading Post Summer Program). Nancy will contact the librarian to find out if they want more books purchased with the money or if they need it to buy more totes to haul the books in. Great job everyone.